Sherlock Holmes is a 2009 British-American neo-noir mystery period action film based on the character of the same name created by Sir Arthur Conan Doyle. The film was directed by Guy Ritchie and produced by Susan Downey and Dan Lin. The screenplay, by Michael Robert Johnson, Anthony Peckham and Simon Kinberg, was developed from a story by Wigram and Johnson. 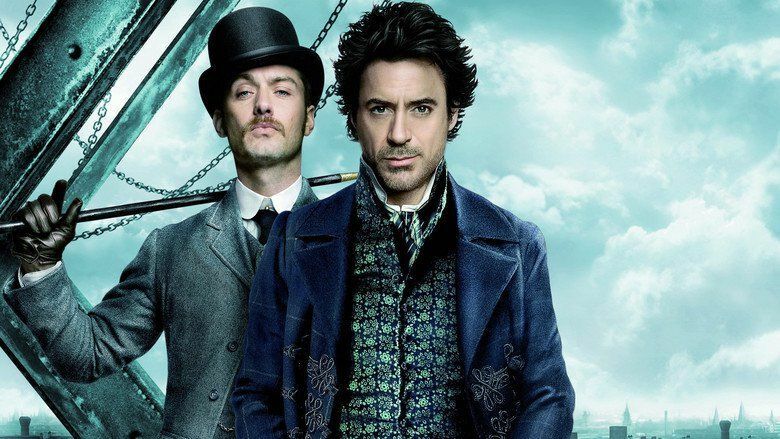 Robert Downey Jr. and Jude Law portray Sherlock Holmes and Dr. John Watson respectively. 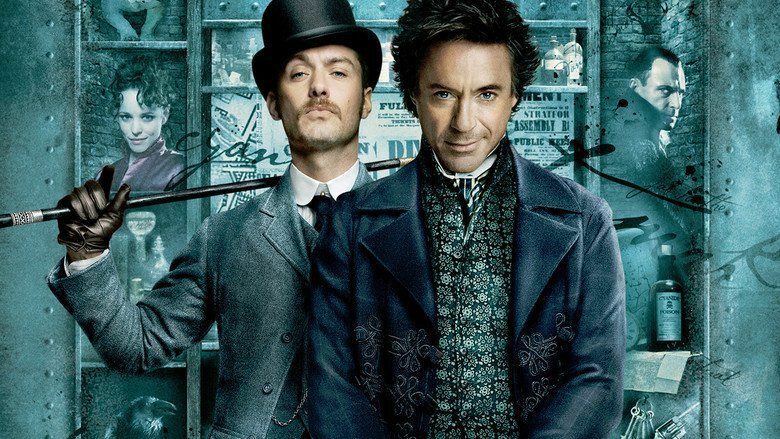 In the film, set in 1890, eccentric detective Holmes and his companion Watson are hired by a secret society to foil a mysticist's plot to expand the British Empire by seemingly supernatural means. Rachel McAdams stars as their former adversary Irene Adler and Mark Strong portrays villain Lord Henry Blackwood. 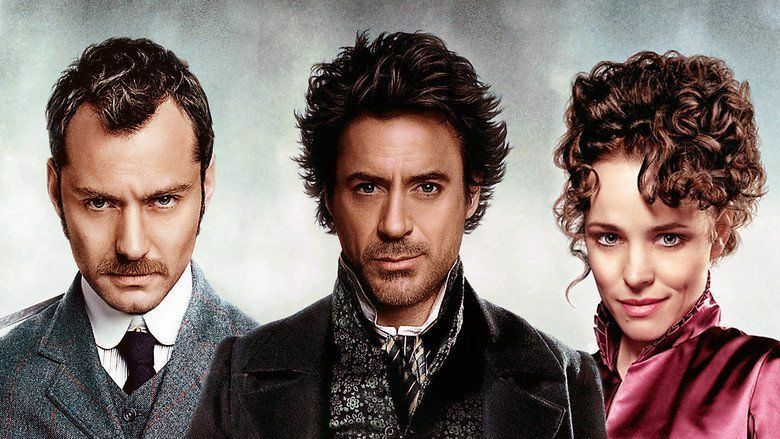 Sherlock Holmes received mostly positive critical reaction, praising the story, action sequences, set pieces, costume design, Hans Zimmer’s musical score, and Downey's performance as the main character, winning Downey the Golden Globe Award for Best Actor in a Musical or Comedy. The film was also nominated for two Academy Awards, Best Original Score and Best Art Direction, which it lost to Up and Avatar, respectively. A sequel, Sherlock Holmes: A Game of Shadows, was released on 16 December 2011. In 1890, private detective Sherlock Holmes and his partner Dr. John Watson prevent the ritual murder of a woman by Lord Henry Blackwood, who has killed five other young women similarly. Inspector Lestrade and the police arrest Blackwood. Three months later, Watson is engaged to Mary Morstan and moving out of 221B Baker Street; while he enjoys their adventures together, Watson looks forward to not having to deal with Holmes' eccentricities. Meanwhile, Blackwood has been sentenced to death and requests to see Holmes, whom he warns of three more unstoppable deaths that will cause great changes to the world. Blackwood is subsequently hanged. Holmes is visited by Irene Adler, a former adversary who asks him to find a missing man named Luke Reordan. After her departure, Holmes follows her as she meets with her secret employer, and only learns that the man is a professor and that he intimidates Adler. Meanwhile, sightings of a living Blackwood and the discovery of his destroyed tomb lead to belief that Blackwood has risen from the grave; Reordan is found dead inside Blackwood's coffin. 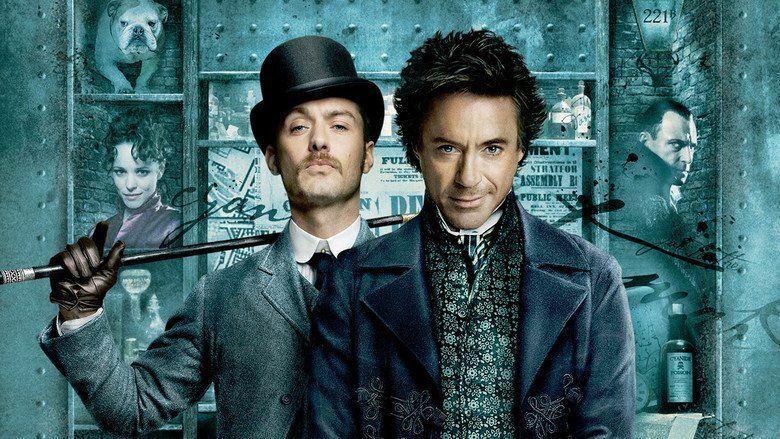 Following a series of clues from the body, Holmes and Watson find Reordan's home and discover experiments attempting to merge science with magic. After they survive a battle with Blackwood's men who attempt to destroy the lab, Holmes is taken to the Temple of the Four Orders, a secret magical fraternity with considerable political influence. The leaders – Lord Chief Justice Sir Thomas Rotheram, U.S. Ambassador Standish, and Home Secretary Lord Coward– ask Holmes to stop Blackwood, a former member of the society and Sir Thomas's son. That night Sir Thomas drowns in his bath as Blackwood watches, and the next night Lord Coward calls a meeting of the Order. He nominates Blackwood to take command in place of Sir Thomas and Blackwood reveals himself to the group. Standish attempts to shoot Blackwood but is set on fire when he pulls the trigger of his gun, and runs out a window to his death. Lord Coward issues an arrest warrant for Holmes, causing him to go into hiding. Holmes studies the rituals of the Order and recognizes their symbols in Blackwood's murders that were staged at specific locations; from this he deduces the targets of the final murder are the members of Parliament. With the aid of Lestrade, Holmes fakes arrest and is taken to see Coward, where he uses evidence on Coward's clothes to deduce Blackwood has conducted a ceremony in the sewers beneath the Palace of Westminster. Holmes escapes and he, Watson, and Adler find Blackwood's men in the sewers guarding a device based on Reordan's experiments, designed to release cyanide gas into the Parliament chambers and kill all but Blackwood's supporters, whom he has secretly given an antidote. Blackwood comes before Parliament and announces their impending deaths, then attempts to activate the cyanide device by remote control, but it is disabled by Adler. Blackwood flees Parliament and sees Adler and Holmes in the sewers, and pursues them to the top of the incomplete Tower Bridge. Blackwood fights Holmes, as the latter deduces how all of Blackwood's supposed supernatural feats were the work of science and trickery. Blackwood plummets off the bridge and falls entangled in a noose of chains, killing him as the chain wrapped around his neck hangs him. Adler explains to Holmes that her employer is Professor Moriarty, and she warns that Moriarty is as intelligent as Holmes and far more duplicitous. As Watson moves out of 221B, the police report to him and Holmes that a dead officer was found near Blackwood's device. Professor Moriarty used the confrontations with Adler and Blackwood as a diversion while he took a key component, based on the infant science of radio, from the machine. Holmes looks forward to the new case and new adversary. 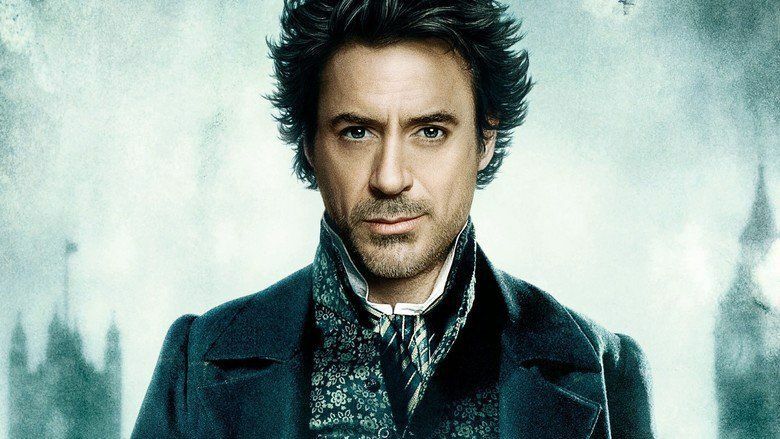 Robert Downey Jr. as Sherlock Holmes, a bohemian scientist and eccentric detective-for-hire who becomes a wanted fugitive in his hunt for Lord Blackwood while constantly being followed by the presence of Professor Moriarty. Downey was visiting Joel Silver's offices with his wife, producer Susan Downey, when he learned about the project. 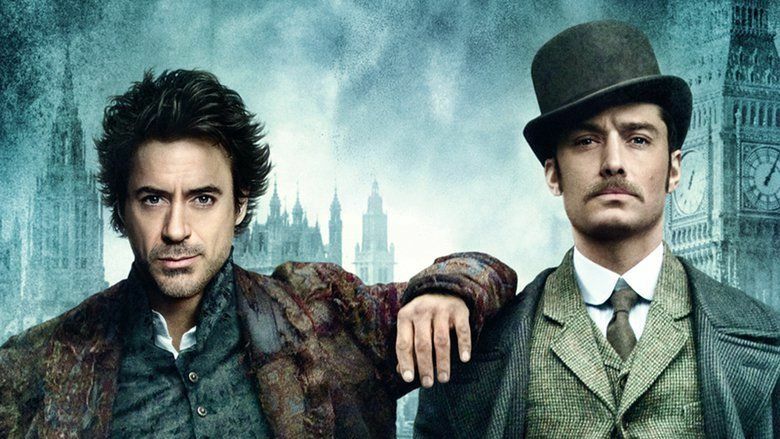 Ritchie initially felt Downey was too old for the role because he wanted the film to show a younger Holmes on a learning curve like Batman Begins. Ritchie decided to take a chance on casting him in the role, and Downey told the BBC that "I think me and Guy are well-suited to working together. The more I look into the books, the more fantastic it becomes. Holmes is such a weirdo". Downey also revealed what his wife had to say: "that when you read the description of the guy — quirky and kind of nuts — it could be a description of me". Downey intended to focus more on Holmes' patriotic side and his bohemianism, and felt that his work on Chaplin had prepared him for an English accent. Ritchie feels his accent is "flawless". Both Downey and Ritchie are martial arts enthusiasts, and have been inspired by the Baritsu mentioned in the 1901 story "The Adventure of the Empty House". Downey lost weight for the part, because during a chat he had with Chris Martin, Martin recommended that Holmes look "gaunt" and "skinny". Jude Law as Dr. John Watson, Holmes' companion and close friend who is also a surgeon and a veteran of the Second Afghan War. Law's Watson is more like the original character, who was more of a colleague, rather than the bumbling fool that actor Nigel Bruce popularised in the 1930s–40s films. Law previously appeared in the Granada Television series The Adventures of Sherlock Holmes, in an episode based on "The Adventure of Shoscombe Old Place". 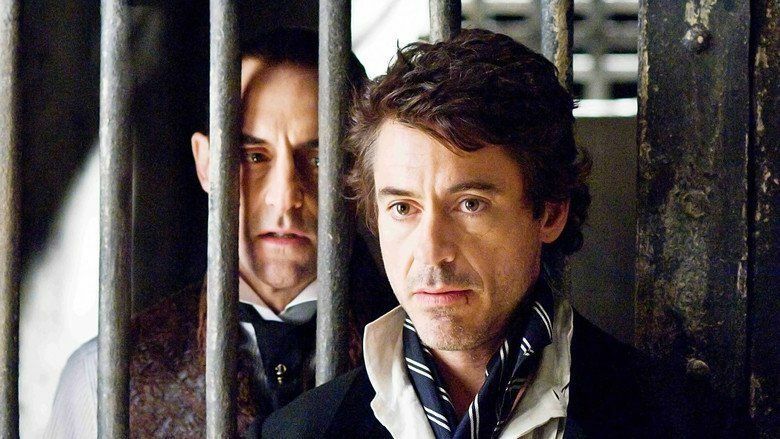 Being a Holmes fan, Law recognised there was material unexplored in other adaptations and was intrigued by Downey's casting; Law was cast because he had a positive meeting with Downey and concurred the film would have to explore Holmes and Watson's friendship. Downey believed by emphasizing Watson's qualities as a former soldier, a doctor, a womanizer and a gambler, it would make for a more interesting foil for Holmes. Law made a notebook of phrases from the stories to improvise into his dialogue. Ritchie originally envisioned Russell Crowe in the role. Mark Strong as Lord Henry Blackwood, an aristocratic serial killer dabbling in the occult to compel others to do his bidding. Having returned after his execution, Blackwood unveils plans to control the British Empire. He is given many supernatural elements to his character, and his presence is usually accompanied by a menacing crow. Strong worked with director Ritchie for the third time and said he appreciates the director's lack of ego and how easy he is to work with. Rachel McAdams as Irene Adler, an American femme fatale from New Jersey who outwitted Holmes twice, as chronicled in Doyle's story "A Scandal in Bohemia". A skilled professional thief, as well as a divorcée, Adler is no longer married to Godfrey Norton and needs Holmes' help for the case. Downey convinced Ritchie to cast McAdams, arguing she would not look too young to be his love interest. In this aspect the film considerably departs from Doyle's original, where Holmes never met Adler again after the one occasion where she outwitted (and greatly impressed) him; the film conversely implies that the two of them met many times and later had an intermittent, hotly consummated love affair. Kelly Reilly as Mary Morstan, a governess whom Watson wishes to marry, causing a conflict with Holmes. Eddie Marsan as Inspector Lestrade, an investigator from Scotland Yard who hires Holmes to look into the murders. Unlike many previous adaptations, in this storyline Lestrade is not portrayed as a bumbling inspector, but is shown to be a rather competent officer (though he is relatively fed up with Holmes). Hans Matheson as Lord Coward, the Home Secretary, who is Blackwood's right-hand man and assisted Blackwood in all his murders. He was one of a small number of Blackwood's allies aware of his usage of technology to feign magical powers. Geraldine James as Mrs. Hudson, Sherlock Holmes' landlady. This is James' second Holmes film. She had also portrayed Dr. Mortimer's wife in the 2002 adaptation of The Hound of the Baskervilles. James Fox as Sir Thomas Rotheram, father of Lord Blackwood, Lord Chief Justice and Head of the Temple of the Four Orders. Robert Maillet as Dredger, a 7-foot (2.14 meter), French-speaking henchman working for Blackwood. William Hope as American Ambassador Standish. Unknown actor as Professor Moriarty, a mysterious figure who Adler is workign for. Director Guy Ritchie declined to reveal the actor who voiced Professor Moriarty. Jared Harris played the role in the sequel, Sherlock Holmes: A Game of Shadows. Producer Lionel Wigram remarked that for around ten years, he had been thinking of new ways to depict Sherlock Holmes. "I realized the images I was seeing in my head [when reading the stories] were different to the images I'd seen in previous films." He imagined "a much more modern, more bohemian character, who dresses more like an artist or a poet", namely Henri de Toulouse-Lautrec. After leaving his position as executive for Warner Bros. in 2006, Wigram sought a larger scope to the story so it could attract a large audience, and amalgamated various Holmes stories to flesh it out further. Some sequences in the movie were more than suggested by uncredited incidents found in a 1979 novel Enter the Lion: A Posthumous Memoir of Mycroft Holmes. Lord Blackwood's character was developed as a nod to Victorian interests in spiritualism and the later influence of Aleister Crowley. The producer felt he was "almost clever" pitting Holmes, who has an almost supernatural ability to solve crimes, against a supposedly supernatural villain. The plot point, moreover, nods to the Holmesian tale of The Hound of the Baskervilles, where a string of seemingly supernatural events is finally explained through intuitive reasoning and scientific savvy. Wigram wrote and John Watkiss drew a 25-page comic book about Holmes in place of a spec script. Professor Moriarty was included in the script to set up the sequels. In March 2007, Warner Bros. chose to produce, seeing similarities in the concept with Batman Begins. Arthur Conan Doyle's estate had some involvement in sorting out legal issues, although the stories are in the public domain in the United States. Neil Marshall was set to direct, but Guy Ritchie signed on to direct in June 2008. When a child at boarding school, Ritchie and other pupils listened to the Holmes stories through dormitory loudspeakers. "Holmes used to talk me to sleep every night when I was seven years old," he said. Therefore, his image of Holmes differed from the films. He wanted to make his film more "authentic" to Doyle, explaining, "There's quite a lot of intense action sequences in the stories, [and] sometimes that hasn't been reflected in the movies." Holmes' "brilliance will percolate into the action", and the film will show that his "intellect was as much of a curse as it was a blessing". Ritchie sought to make Sherlock Holmes a "very contemporary film as far as the tone and texture", because it has been "a relatively long time since there's been a film version that people embraced". Filming began in October 2008. The crew shot at Freemasons' Hall and St Paul's Cathedral. Filming was conducted in Manchester's Northern Quarter. Manchester Town Hall was extensively used for numerous scenes with some minor CGI modifications. The interior courtyard was used for a fight scene, the Great Hall doubled as the House of Lords and numerous areas such as the landing were used as a backdrop. They shot the opening scene for three days at St Bartholomew-the-Great church in London, and shot on the river Thames at Wapping for a scene involving a steamboat on 7 November. Filming continued at Stanley Dock and Clarence Dock in Liverpool and The Historic Dockyard, Chatham. Street scenes were filmed in cobbled alleyways in Chatham and Manchester. Brompton Cemetery in London was used for a key scene, and the palatial 19th-century interior of the Reform Club stood in for the Café Royal. Scenes from the interior of 221B Baker Street were shot on a sound stage at Leavesden Studios. In late November 2008, actor Robert Maillet, who played Dredger, was filming a fight scene at Chatham Dockyard in Kent, and accidentally punched Robert Downey Jr. in the face, causing Downey to be bloodied and knocked down, but not knocked unconscious as originally reported. The Sun reported that on 28 November, a tank truck caught fire, forcing filming to stop for two hours. When filming at St John's Street in December, the schedule had to be shortened from 13 to nine days because locals complained about how they would always have to park cars elsewhere during the shoot. In January 2009, filming moved to Brooklyn. Ritchie wanted his Holmes' costume to play against the popular image of the character, joking "there is only one person in history who ever wore a deerstalker". Downey selected the character's hat, a beat-up fedora. 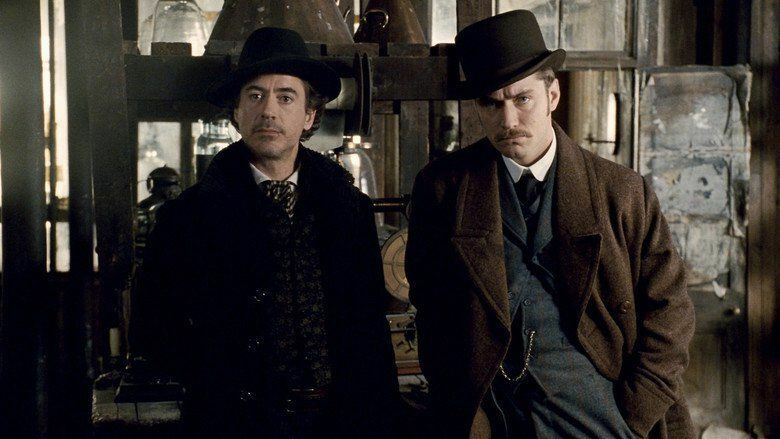 The director kept to the tradition of making Holmes and Watson's apartment quite messy, and had it decorated with artifacts and scientific objects from the continents they would have visited. The soundtrack for the film was composed by Hans Zimmer. It was released on 12 January 2010. The film had its world premiere on 14 December 2009, in London and was subsequently released worldwide on 25 December 2009 (26 December, boxing day, in the UK and Ireland), after being pushed from a November release date. An advance charity screening was held in select locations in Belgium on 10 December 2009. 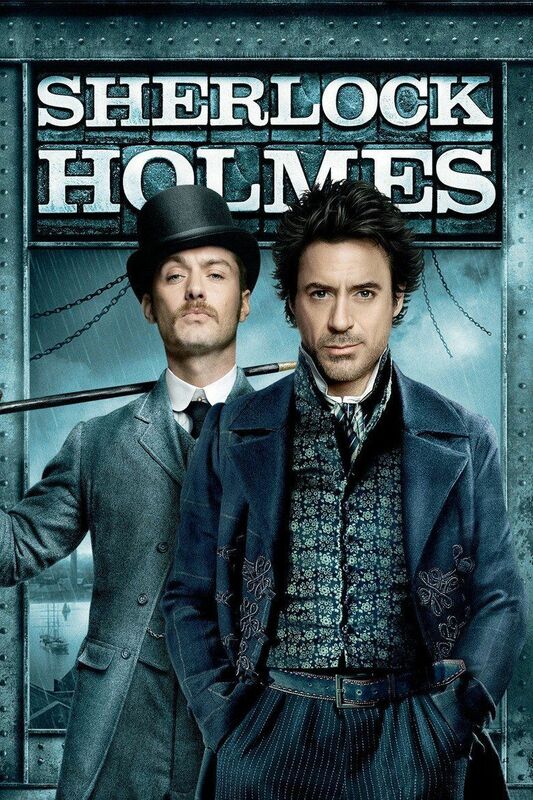 Sherlock Holmes was released on DVD and Blu-ray/DVD/digital on 30 March 2010 in the United States. The film has since grossed $44,908,336 in DVD sales. The film opened to an estimated $62.4 million in its first weekend in America alone, placing in second at the US box office to Avatar, which grossed $75.6 million. The film earned a strong per-theater average of $18,031 from its 3,626 theaters. Its one-day Christmas sales broke records. Sherlock Holmes had grossed $523,000,000 worldwide making it Guy Ritchie's biggest box-office success yet, and the 8th highest grossing film of 2009 worldwide, and domestically. On the domestic charts, it is the fourth highest-grossing film to never hit No. 1 in the weekend box office, behind My Big Fat Greek Wedding, fellow Christmas opener Alvin and the Chipmunks: The Squeakquel, and said film's predecessor. Worldwide, it is the fourth highest in this category, behind Ice Age: Dawn of the Dinosaurs, Casino Royale, and The Day After Tomorrow. The film received generally positive reviews. Review aggregate Rotten Tomatoes reports that 70% of critics have given the film a positive review based on 224 reviews, with a rating average of 6.2 out of 10, with the consensus being that "Guy Ritchie's directorial style might not be quite the best fit for an update on the legendary detective, but Sherlock Holmes benefits from the elementary appeal of a strong performance by Robert Downey, Jr." Metacritic, which assigns a weighted average score out of 1–100 reviews from film critics, has a rating score of 57 based on 34 reviews. Roger Ebert of the Chicago Sun-Times gave the film three out of four stars and highlighted the film's strong characters, visuals and action-packed plot; the characters were also praised by Jake Tomlinson of Shave Magazine, who believed that Downey Jr. and Law were "perfect together" and that Strong was "a convincing and creepy villain". A. O. Scott of the New York Times noted that the director's approach to films was "to make cool movies about cool guys with cool stuff" and that Sherlock Holmes was essentially "a series of poses and stunts" which was "intermittently diverting" at best. David Stratton of The Australian disliked the film's interpretation of the original Holmes stories and concluded, "The makers of this film are mainly interested in action; that, they believe, is all that gets young audiences into cinemas today. They may be right, but they have ridden roughshod over one of literature's greatest creations in the process." He praised the production design and score. On 17 January 2010, the Hollywood Foreign Press Association announced the winners of the 67th Golden Globe Awards with Robert Downey Jr. winning Golden Globe Award for Best Actor – Motion Picture Musical or Comedy for the portrayal of Sherlock Holmes. The Broadcast Film Critics Association nominated Hans Zimmer for Best Score but lost to Up by Michael Giacchino. The film was nominated for Best Original Score and Best Art Direction at the 82nd Academy Awards. The film won Best Thriller at the Empire Awards. The film was nominated for the Vits Awards for "Best Music" and "Best Effects".